Editor’s Note: Investigating the moral and political meaning of new technologies has been central to the mission of this journal since its founding, and few new biotechnologies raise such vexing questions as human cloning. With the recent creation of the first cloned human embryos, the implications of human cloning deserve more attention than they have received from policymakers, the news media, academic bioethicists, and the public at large. 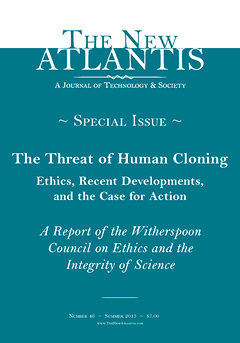 And so we devote this entire issue of The New Atlantis to a report from the Witherspoon Council on Ethics and the Integrity of Science examining human cloning and making the case against it — whether for the purpose of producing children or for the purpose of biomedical research.